Blues Legend Elvin Bishop helping The Kids Like Blues Band! Legendary blues guitarist Elvin Bishop is helping second grade students in The Kids Like Blues Band get excited about performing blues music and learning academics! Awhile back, we contacted Elvin and asked him if he would be willing to act as a penpal and mentor to our blues band, which is comprised of 30 students in Mr. Schwartz’s second grade class in Oceanside, CA. What better way to get these 7-year-olds stoked on learning and gaining new blues chops than striking up a relationship with a blues legend? We were thrilled when Elvin responded to our email by calling us up and asking, “How can I help?” I guess we shouldn’t be too surprised though, because as Downbeat Magazine said, “Bishop is a good-hearted soul whose life mission is to entertain to the best of his ability.” I guess we can now add helping young kids to his resume! As The World’s Youngest Blues Band, we need some tips from masters like Elvin. He is a historical figure in the blues with 5 decades of performing experience. We have some big gigs coming up soon and he can help us prepare for them. On March 13 we are playing the Sage Hospitality Group’s 2013 Corporate Leadership Conference at the Del Mar Hilton which will be attended by the Mayor of Del Mar and the Sage Hospitality President. Sage Hospitality is even paying for our transportation and donating computers to our class! Though we’re best known for our music (see our great performance video of Sweet Home Chicago here) we are first and foremost second grade students who are required to learn the CA State Academic Content Standards. Being in contact with Elvin will help us master these standards. We need to learn how to write letters; it’s CA Standard Writing Applications 2.2. The kids are writing letters to Elvin, and knowing that a famous bluesman will be reading their work is motivating them to write to their highest potential. Having an audience that matters to them is really important. We are also doing a lot of internet research on his career. I teach the kids internet safety and how to use the internet as a research tool. In fact, over 95% of our students have their own personal, private, anonymous blogs. In our research we found that he comes from Tulsa, Oklahoma. We did a google maps search for Tulsa on the LCD projector and the kids were BLOWN AWAY by the features of the interactive online map. They were stunned at how we could zoom in and out, all the way from an outer space view to a street level view. Of course the kids insisted on then looking up our own location, and they just about had a cow when we found our school! Map skills are also an important second grade standard. We are going to start doing compare and contrast exercises using Elvin’s career and music, and the Kids Like Blues Band’s career and music. He’s 70, these kids are 7. He’s a blues legend, and we’re, uh, up and coming. It’s easy to fill in a Venn Diagram with things that we don’t have in common, but there are characteristics that Elvin Bishop and the Kids Like Blues Band share. We both have a website, we both enjoy old school blues songs, we both have a slide guitar player in our band, and we both make recordings. In fact, we have all been students, and that leads us to a fact that thrilled the kids: Elvin was such a great student that he won a scholarship to a college of his choice. It turns out he won a National Merit Scholariship in the late 1950’s and chose to go to The University of Chicago so he could learn the blues from the masters. For more info see the “About” page on his website. When I told the kids this, they couldn’t believe that a famous bluesman was also a straight-A student! What a great role model! One of the girls shouted, “Hey, that’s not fair my sister gets straight A’s and my mom has to pay for her college!” The more we learn about Elvin and his work and history, the more questions the kids will have, and the more interesting their letters to him will be. I think he will get a huge kick out of reading them. Once we finish our research on his career and music and compare it to our own, we will do a multi-paragraph expository nonfiction modeled writing piece. We will be reviewing elements of writing like spelling, grammar, indenting paragraphs, topic sentences, staying on topic, descriptive writing, and penmanship. The kids will also be making drawing of Elvin by hand, scanning their drawings into the computer, modifying the work in Photoshop, and uploading it to their blogs. Yes, second graders can do all of this! Watch my students show off their tech skills in this video: Classroom Technology in Mr. Schwartz’s Class: Blogging and Photoshop. We are also considering doing a Skype chat, and if our internet connection won’t support that, we can do some conference calls. Elvin will also be down in Southern CA is May so we are hoping that we might have an opportunity to meet up with him when he comes down, either through a classroom visit, or maybe meeting him near one of his concerts. Elvin also gave us permission to record his song “Calling All Cows” so we are going to have to add that to our repertoire of 16 songs. The kids heard it for the first time yesterday and they loved it. Many thanks to Elvin for his help. It means a lot to the kids and it will help them in so many ways! We’re also hoping to partner with other blues musicians in a similar manner, from being pen pals to laying down tracks on our upcoming recordings or doing class visits. 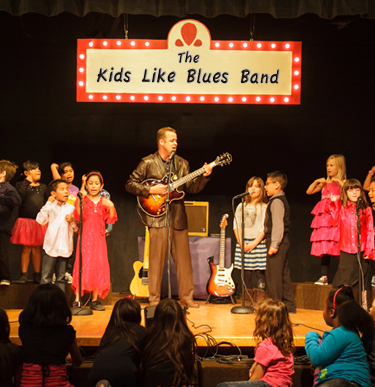 If you’d like to get involved with the Kids Like Blues Band, please send an email to kidslikebluesinfo@gmail.com..